Gujarat is famous for its snacks and breakfast recipes across the country. 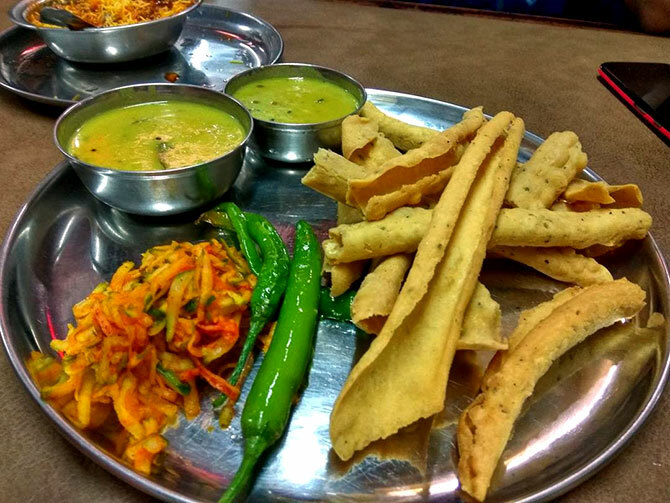 Yummy snacks such as chakri, khakra, ganthia, khandavi, dhokhla, fafda and sev are enjoyed outside the state as much as they are loved by locals. Khakhra is one such popular Gujarati snack. Thin, crispy sheets, infused with desi flavours, khakhra has become a quick snack option for those looking for regional flavours. It is easy to carry, light and comes in a variety of flavours. However, people often confuse a khakhra with another Gujarati snack called fafda. Let us tell you that they are not the same and a number of differences set them apart. Khakra could be described as an indian-style cracker and Fafda, on the other hand, is a deep fried farsan. How is Khakra different from Fafda? This is the most basic difference between a khakhra and fafda. Traditionally, khakhra is made using wheat flour. Fafda is made using besan or gram flour. The use of different types of flour ensures that the texture and taste vary too. You will also find the use of matki, a type of bean (also called Turkish bean) in khakhra. Other ingredients used to make fafda include turmeric and carom seeds. For making Khakra, all the ingredients (mat bean, wheat flour, and masalas) are kneaded with oil, water or milk. The dough should be soft to get the perfect crunchiness. Small chunks of the dough are rolled into flat discs which are then roasted. The ingredients for Fafda are kneaded together using water. The soft dough is shaped into thin, long strips which are then deep fried. Khakras are usually round and chapati-like and off-whitish in colour. While fafda is generally long cylindrical in shape and light yellow in color. Unlike fafada, Khakras are available in many different flavors like methi (fenugreek), jeera (cumin), bajra, pudina, garlic and ajwain. Its taste varies depending on the flavor. Now that you know the difference, how about making these yummy dishes at home this weekend? Both khakhra and fafda are wonderful tea-time snacks and so much more flavourful as compared to regular store-bought cookies and biscuits.